Are Food Steamers healthy? Yes, they are. Whether you are looking to maintain a healthy lifestyle or lose weight, using a food steamer will get you on the right track. Just some of the health benefits of steaming your food? 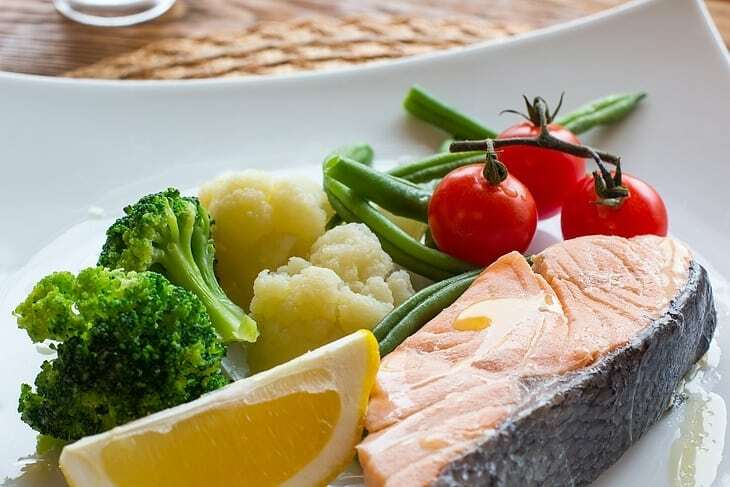 Steaming is by far the best way to maintain a healthy diet and lifestyle. When you steam food, it retains more minerals, vitamins and enzymes than any other form of cooking. Steaming assists with weight loss, if that is your goal. The food is fresh, natural and full of flavour goodness. No oil is required. There is an endless list of the foods that steam well; from fish, vegetables, fruit, poached eggs, herbs spices, chicken, shellfish, puddings. We talked about How To Choose The Best Vegetable Steamers. However, not all of us are vegans and you may want to enhance your healthy menu with other categories like salmons, meatballs or dumplings. Therefore, today we will talk about Food Steamers in general. Why you need a food steamer in your kitchen and how to pick the best one for your own needs. Keep reading to the end to get all the useful tips for purchasing for a food steamer. When you are trying to eat a healthier diet, the way you cook your food makes a considerable impact. Foods that are fried or cooked in butter add empty fat and calories to your diet. A food steamer takes a lot of the work out of cooking and is a healthier way to prepare vegetables, rice and many other foods. There are many benefits to using a food steamer and one of the greatest advantages is that you get to enjoy the full flavor of your food. The taste of your food will not be marred by added oils or sauces. Steaming brings out the full flavor of root vegetables, cruciferous vegetables and meats. You can also reheat foods like tamales in the steamer. Other benefits of having a steamer in your kitchen are that you can keep nutrients and reducing fat as well as calories in your meal. According to this website﻿﻿﻿﻿﻿﻿, tamales and Chinese dumplings taste better when reheated in a moist environment. With a food steamer, your meal may be ready faster than if you tried to cook foods on the stovetop. Why Should I Have A Food Steamer? All mothers spend lots of her time per day preparing for her child meals. 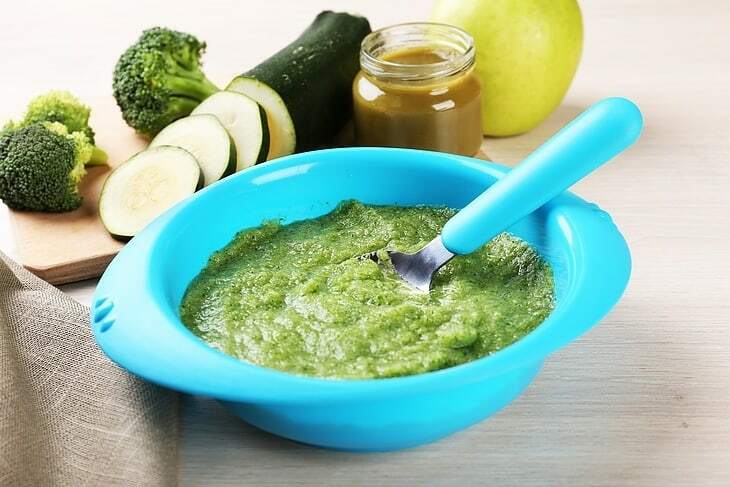 Baby foods need to be well cooked and full of nutrients. A food steamer can help you to carefully boil those foods without worrying you will overcook them or lose out on the important nutrients. By steaming your foods, you get to keep all of the healthy vitamins. So if you're having a baby, a food steamer is the best choice for you. I wish I would have had a food steamer when my oldest daughter was a baby. Having one of these appliances back then would have made it easier for me to make her baby foods like sweet potatoes and carrots. Another good reason to use a food steamer is when you need to save time in the kitchen. Many food steamers have a timer so you can cook your foods while doing the laundry, picking up the kids or even going to the mall. It is totally safe and time saving. Now that I have three growing children who are in school, time is at a premium. I find that having a food steamer allows me to get dinner going and ready on time so that I can get the kids to their next activity. Plus, it makes me happy knowing that my kids are getting a healthy meal that tastes good because of how the food steamer cooks their vegetables. I wish I'd had a steamer when I was a busy college and graduate student. I could have eaten a much healthier diet with more vegetables instead of the peanut butter sandwiches I ate almost every day! To find the best food steamer, you will want to consider what types of foods you will cook in it and how often you plan to use it. The best food steamers come in a variety of sizes and with different features to help make mealtime a simple and enjoyable experience. This website about cooking vegetables suggests that you should choose the simplest food steamer that can accommodate all of your needs. If you only occasionally steam foods, a basic stainless steel steamer that fits over one of your cooking pots is a great choice. If you are planning to steam most of the foods that you cook, you need a larger steamer and offers some extra bells and whistles, like a timer and a thermometer. Keep in mind your budget for the steamer and how much wear and tear your existing pots can handle. A steamer with multiple trays can be very convenient when you need to steam a variety of foods all at once such as parties for friends or family dinner. One tray for meats, one tray for dumplings and another tray for vegetables. A steamer with multiple trays can be very convenient when you need to steam a variety of foods all at once. If you have a small kitchen, you might want a collapsible steamer that does not take up as much space in your cabinets. Worry about scratching the interior of your new food steamer? Pick one that has a silicone finish which is easy to wash because your food will not stick to it. 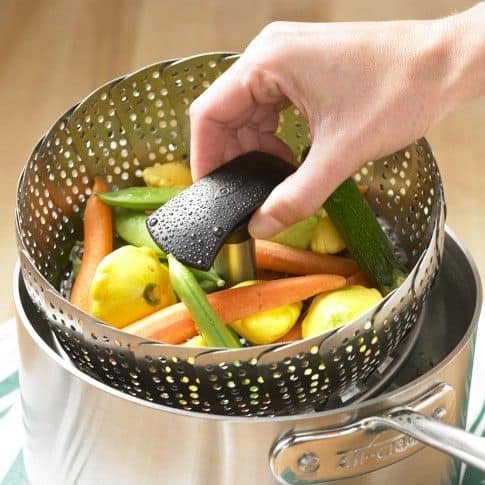 If you plan to use the food steamer on most days of the week, look for one that is built from durable materials such as silicone instead of plastic. Silicone pot inserts are a good choice because they will not scratch the finish on your cookware. Other things to look for when selecting a food steamer include the ease of cleaning it, whether it consumes electricity, how much food it can cook at once and how durable the material is. This Oster electronic food steamer has a spacious interior with plenty of room to prepare up to 1 pound of vegetables for each tray. Because there are two tiers, you could use one for meat or eggs and the other for vegetables or dumplings. The easy-to-use electronics allow you to set the food steamer to run for a specific period of time or to reach a certain temperature. You can delay the cooking time for up to 12 hours, which means that your food could be perfectly steamed by the time you get home after work. An automatic warm setting keeps your food at just the right temperature for up to an hour. This allows you to finish your side dishes and set the table. Most of the parts of this Oster food steamer are dishwasher safe, which makes the cleanup process fast and easy. This steamer has a drip tray to catch juices as they are released from foods. Each tier is collapsible for easy storage. An exterior water level indicator allows you to monitor how much water is left inside so that you can add more as necessary. This is one of the more expensive kitchen steamers. This Euro Cuisine electric food steamer is made from tarnish-free stainless steel. It has two baskets that can each hold 8.5 quarts of food. There is enough space in this steamer to prepare a main dish and side for a family of four or five people. A tight-fitting lid with an integrated handle makes it easy to lift up the lid. This steamer has a reservoir of 4.5 quarts, which will steam tough foods like turnips and yams without running out of water. This steamer uses a digital screen so that you can set up the cook time and start time. The automatic shutoff turns off the steamer when the cook time is reached or when the reservoir is emptied. The automatic timer runs for up to 90 minutes and then switches over to the warming function. The tiers can be removed and washed by hand or in your dishwasher. This steamer has a sleek design that coordinates with other kitchen appliances. No plastics are in contact with your food. The stainless steel parts are durable and can be used every day without any noticeable wear and tear. There is nowhere for the juices to drip. The reservoir is hard to fill. The Circulon Stainless Steel Universal Steamer with Lid fits onto pots that hold 2, 3 or 4 quarts. It fits inside of both tapered and straight pots and can be lifted in and out with two seamlessly attached handles. This is a workhorse steamer and is made for daily use. A shatter-resistant glass lid helps to facilitate the steaming process so that food gets done quickly. 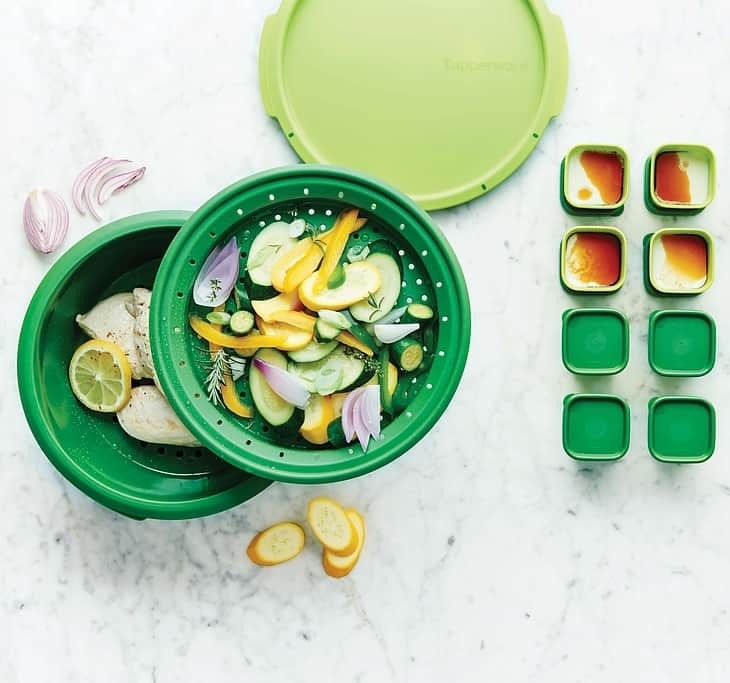 The lid has a knob to make it easier to check on the food during the cooking process. This steamer can also go into the oven and is safe up to 500 degrees Fahrenheit if you want to melt cheese or another topping on top of the steamed food. This steamer will not rust even if you let it air dry. It is easy to clean and can go into the dishwasher. This is one of the lowest-costing food steamers with a lid. The handles get hot, so you will have to use oven mitts when picking up the steamer. You have to monitor the food and be near it while it is in use. Unlike silicon steamers, you will need to be careful about scrubbing it should food residue get stuck. The Heaven Fresh HF 8333 NaturoPure Digital Food Steamer is easy to use for a person who has never tried a food steamer before. It has six built-in programs for different types of foods, such as corn and eggs. An LCD screen makes it easy to see how much cooking time is left for your food. There are three tiers on this food steamer, and you can use one, two or all three at once. 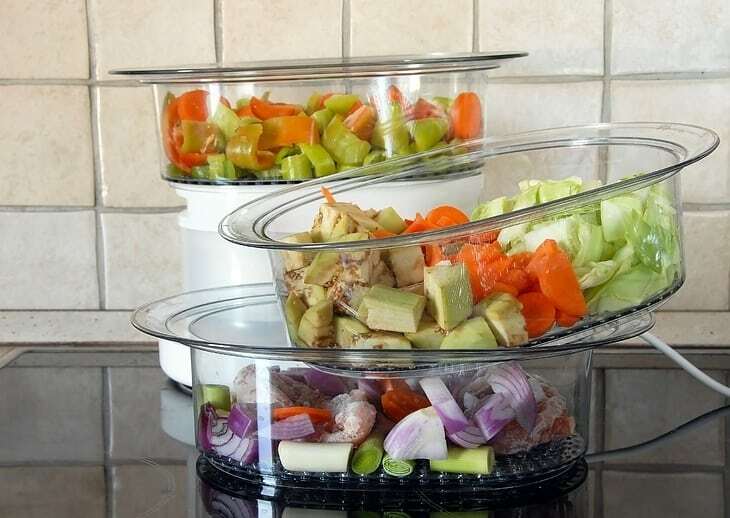 The tiers are made from a clear plastic material so that you can check on your food without having to lift up the lid and lose the heat and steam. You can also see how much water is left in the reservoir through the side indicator. This steamer works quickly and starts steaming within just a few minutes. It can have even the thickest and toughest foods ready to eat within 30 to 60 minutes. The steamer is easy to put together and program. Each of the tiers fits together tightly. You can fit up to 2 quarts of food in each of the tiers. The plastics in this product include BPA, which may leach into the food if you cook acidic foods like tomatoes. The tiers are not dishwasher safe. The Maxi - Matic EST- 2301 Food Steamer has enough space to prepare a meal for a family of four with a total of 8.5 quarts. This set includes two 3.5-quart bowls and one 1.5-quart bowl. When not in use, the bowls will nest into each other to conserve space in your cabinets. You can set up this food steamer with a 60-minute timer, which gives you plenty of time to prepare any other foods you are having for dinner. An automatic safety off switch shuts down the steamer so that you do not have to worry about your food overheating or being overcooked. The bowls are made from a BPA-free plastic and include removable egg nests for perfectly steamed eggs. You can cook six eggs in each of the larger bowls. The egg inserts make it convenient to cook eggs without the eggs rolling around. This steamer is easy to keep clean. This steamer cannot be set up on a delay to cook your food. The base is made of a brittle plastic that does not seem durable. The bowls are difficult to fit together just right in order to get a tight seal to keep the steam inside. The winner for the best food steamer is the Oster 5712 Electronic 2-Tier 6.1-Quart Food Steamer. It adds convenience to your life because you can load it with food, fill the water reservoir and go about your day. When you come home, your food will be ready to enjoy. The drip tray makes this food steamer easy to clean. This steamer has plenty of space to make a meal for several people. It is even easy to store in small kitchens. What do you think about these food steamers? Which is your favorite type of steamer for cooking foods? Please share your thoughts in the comments and share this article if you liked it!